If you've got any comments, ideas or just want to contact us for some reason- then go ahead! 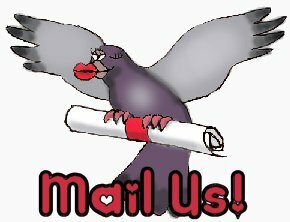 Hit the carrier pigeon to mail us! If you'd like to contact any of our members or use instant messaging to reach us then see the Member List on the menu bar to the left. Useful technical assistance for members when trying to submit articles, events and gallery items to the website. 'Cookie' problems meaning our 'Who's Online' box claims there's more people online than there actually is! A problem in Opera browser I think.